I think the colors are just wonderful...I want to keep it for myself!! 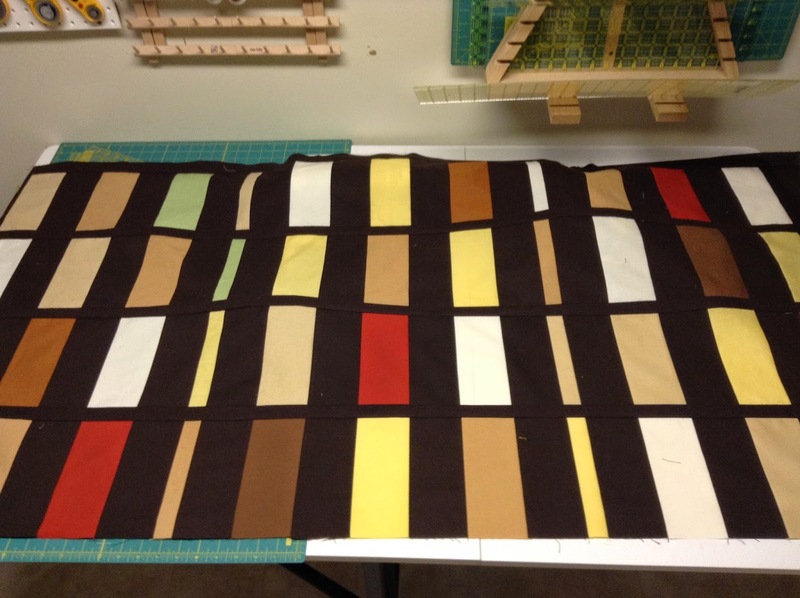 Laying out the colors to these type of quilt is always a challenge. You want it to look random, but you can't take a chance that random won't look right so you have to plan the random layout!! Then you have to make sure that you don't turn a block or row the wrong way messing up your random layout. I numbered each row with a post-it pinned to the left end. When as I was putting these rows together I was pressing my last sewn seam and when I turned it over I realized I had used my quilt marking pen to write the numbers on the post-it, my number was gone. The ink disappears with heat! So I stopped everything and went back over my post-its with a pencil so the numbers won't vanish on me again! I really like this one Bobbi! I wouldn't have thought to use black sashing but it really sets off the colors nicely. And I am a sucker for small hexi's so I will be looking forward to seeing what you are going to do with them! I will keep you posted on the small hexi's. This size didn't end up being to bad. Any smaller and I don't think I would like working with it, but I have yet to do any of the small diamonds that go with it..they may be trouble! !